It all started with the free swag. 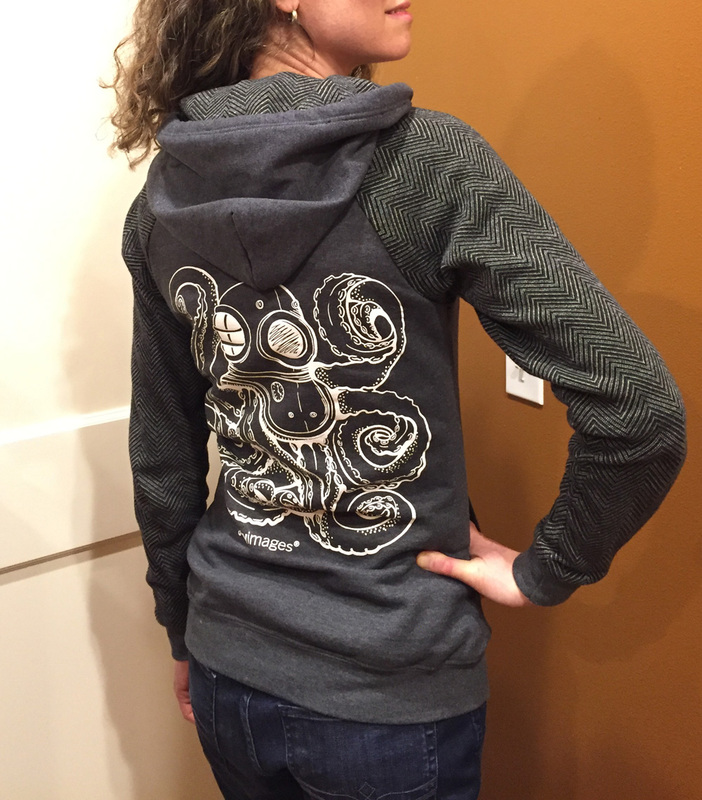 The company I work for gave out several hundred gray hoodies (with a giant octopus on the back) before the winter holiday break 2015, and I was lucky enough to snag a size small for myself. Only problem was, whenever I put it on, it didn’t look or feel right on me. Hey, I’m small, the sweatshirt is small, what’s the problem here lady? The problem was that I just couldn’t get excited about wearing it. Not only was it lumpy, the thought of wearing a company “uniform” also didn’t feel very fun. 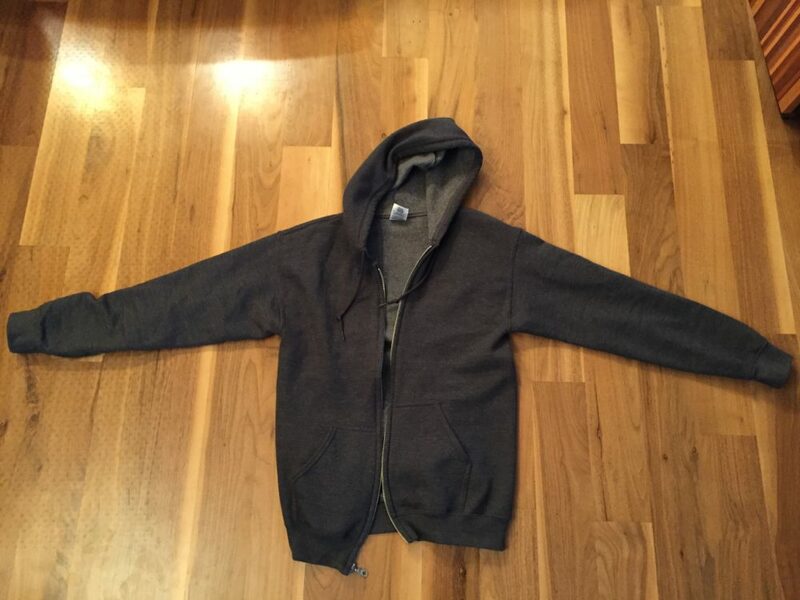 Just a regular gray hoodie, nothing to see here. People who know me may be wondering here, “I thought you loved uniforms!” This may be true, but while I have always loved the styling of sports and other official uniforms, the idea of wearing the same thing as other people has always felt really wrong to me. Can someone please coin a word for this concept? The desire to be the only person wearing a uniform. A solouniformist.? A nonconuniformist? A uniqueformer? Back to the hoodie. In order for me to wear it, it would have to change. My first idea was to turn it from a set-in sleeve garment to a raglan which would feature “interesting” sleeves. I began looking for a Sacrificial Garment which I could dismember and create new pattern pieces. Fortunately the right garment was awaiting me patiently in my armoire: A $12 red knockoff Adidas tracksuit jacket that hadn’t gotten much wear for the past year. It was made of the kind of fabric you would see in a uniform, with the tiny air holes. This is the only photo I could find of the sacrificial garment before I sacrificed it. I carefully removed the sleeves from the body and began to see how the pieces fit together. 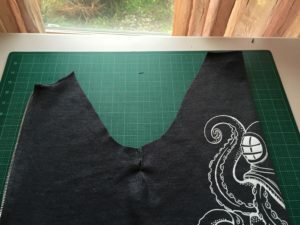 Then I remembered from that one pattern making class at Joann Fabrics 6 years ago that I needed to account for the seam allowance that the sacrificial garment no longer has! Once I had transferred my pattern to some very nice quality sketch paper (I’m not a fan of tissue paper) I was ready to go shopping. I had a revelation at Value Village Burien. For those like me, who often lament the decline of quality in textiles over the past few decades, here was a major time travel moment. I was back in the 80s in a Delorean, when today’s old men were in their prime, making business deals on the golf course. Here were hundreds of casual preppy man uniforms, a source of many yards of high quality fabric, and at $3, almost free for the taking. Once I was unshackled from the requirement of finding clothes that fit me, I could focus on things that would easily jump out at me like Color, Texture, and Largeness. I had stumbled onto one of the things that makes good social but not economic sense: all sizes within a single clothing style are priced the same. When source fabric is what you’re looking for, you are at a huge price advantage when you buy XL clothing. My cart filled up much sooner than it took to exhaust my search, a first for me in my life of thrifting. I left the store with a huge pile of 20 or so shirts, and only spent about $60. The first thing I did upon entering the house was to run everything through the washer and dryer to kill any possible bedbugs. Sigh. It’s what you’ve got to do these days. The next crucial step, I only started doing on my second fabric shopping trip. It eventually became my custom to lay each garment out flat on the floor to inspect, photograph, and provide warm surfaces to napping cats. This last part was highly amusing. Every time I laid down a new shirt on the floor, a cat would appear out of nowhere and proceed to circle, sprawl, roll and attempt to nap on it. I found that taking the photos is a very important step, because when your refashioned garment is complete, a “before” photo really gives people a sense of awe. 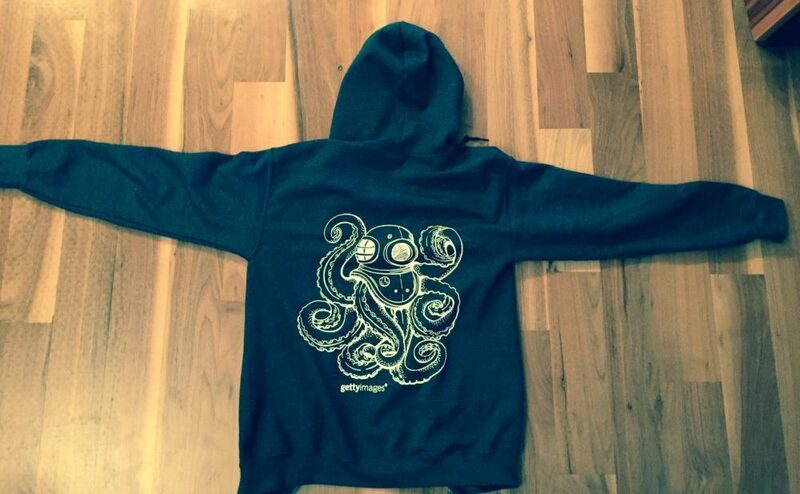 When people see the new hoodie, they sometimes ask if I altered it. Yes, I did alter it, but usually I consider alteration to be taking in a seam here, maybe adding a new hem. 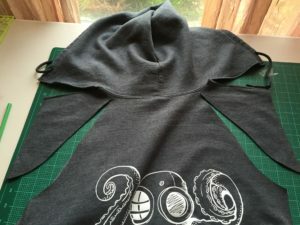 What I did with this new garment was to completely re-cut the shapes of the garment, transplant new sleeves onto it, take in the sides, line the hood with matching fabric and replace the zipper with a red one from Zippershipper. All while maintaining the bottom ribbing in place. I’m still not quite sure how I didn’t completely screw it up. 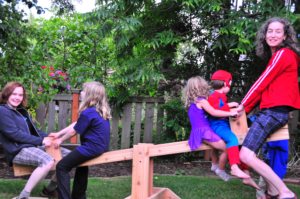 It took a leap of faith, which really paid off. 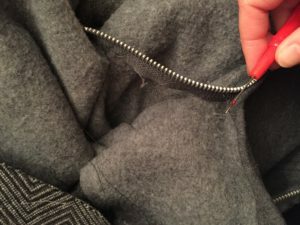 Get that cold metal zipper out! Back view. 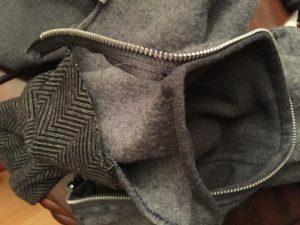 The hood inner lining matches the herringbone sleeves. This article was about the process that led up to the creation of my first refashioned garment of 2016. Next I hope to get into more of the “how” for people interested in trying it themselves.